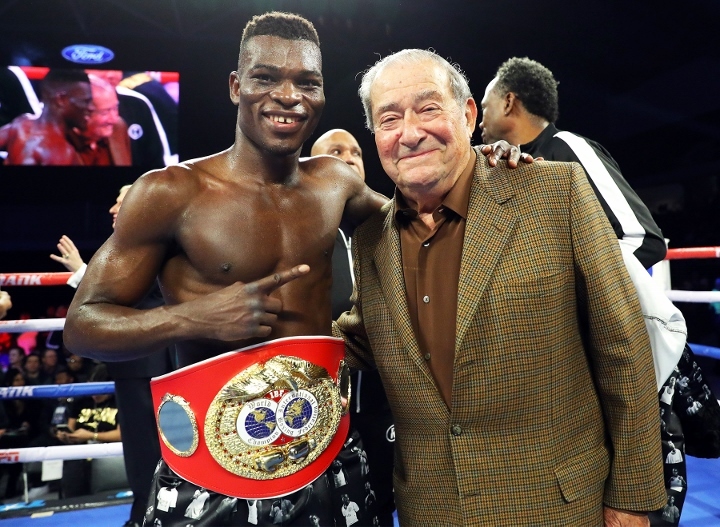 Now that Bob Arum has seen Richard Commey demolish an opponent, the 87-year-old promoter realizes just how dangerous Commey could be for Vasiliy Lomachenko. Barring something unforeseen, Commey will be Lomachenko’s opponent April 12 at Staples Center in Los Angeles. Ghana’s Commey knocked down Russia’s Isa Chaniev three times and stopped him in the second round Saturday night to win the vacant IBF lightweight title at Ford Center at The Star, the Dallas Cowboys’ training facility. Arum, Lomachenko’s promoter, considers Commey a dangerous foe for Lomachenko, if not a well-known opponent. The 31-year-old Commey (28-2, 25 KOs) stands at least two inches taller than the 5-feet-7 Lomachenko and is a bigger puncher than the skilful southpaw. Arum claims none of those disadvantages concern Lomachenko. Ukraine’s Lomachenko (12-1, 9 KOs) could opt to make what would be a safer mandatory defense of his WBA world lightweight title against England’s Anthony Crolla (34-6-3, 13 KOs), a former WBA lightweight champ. A purse bid for the Lomachenko-Crolla contest is scheduled for February 13 at the WBA’s headquarters in Panama City, Panama. The three-division champion made it clear to Arum, though, that he wants to face Commey in what would be a 135-pound title unification fight. The only potential obstacle to making Lomachenko-Commey next is Commey said following his blowout of Chaniev that he hurt a knuckle on his right hand in the first round. If he doesn’t have a prohibitive hand injury, Commey should be able to make the fast turnaround required to battle Lomachenko in a fight ESPN would televise because he made such quick work of Chaniev.